Last year I spent hours going through pension documents for an investigative project entitled Our Financial Mess, which focused on problems within the Memphis city government. 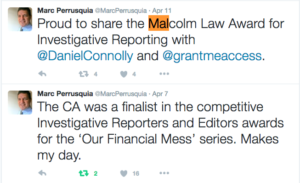 This year, the other members of the team and I won the Malcolm Law Award, Tennessee’s top prize for investigative reporting. We’ve also won national recognition, including being named finalists in the Investigative Reporters and Editors contest. I want to acknowledge our leader Marc Perrusquia, Grant Smith and all the other members of the team. Investigative reporting is at the core of my approach to journalism, and you’ll see that reflected in The Book of Isaias. Much of it is based on immersion reporting – that is, things I saw myself – but I also made a point of verifying facts through documents, ranging from a Florida death certificate to Government Accountability Office reports to internal e-mails sent between federal education officials. Investigative techniques made a strong story even better. 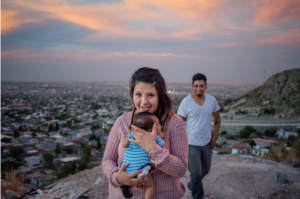 Only a few years ago, the Mexican border city called Ciudad Juárez was one of the most dangerous places in the world. Now it’s coming back to life, and National Geographic just published an important story documenting the change. I’m proud to say that both the writer and photographer on the National Geographic project contributed to The Book of Isaias. Writer Sam Quinones, a winner of the National Book Award, was one of the first people to offer me advice on my book project many years ago, and he was also one of the first to read my book manuscript and write a blurb for it. And photographer Dominic Bracco II worked with me on my crucial trip to Mexico in the summer of 2013. Some of his photos will appear in The Book of Isaias when it’s released this October. I’m happy to know both of these journalists! You can see their work on Ciudad Juárez here.